The AEV 10th Anniversary / Hard Rock Winch Mount is designed specifically for the OE Mopar steel front bumper found on the 2013-18 10th Anniversary Rubicon, Rubicon X, Hard Rock, 75th Anniversay and Recon edition JK Wranglers. AEV’s 10th Anniversary / Hard Rock Winch Mount provides a strong, integrated mounting solution for anyone wishing to install a winch in the OE steel front bumper. 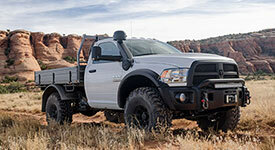 The mounting plate bolts directly to the vehicle’s frame, giving you the freedom to install most winches with an off-set configuration, such as the Warn 9.5xp (separate Mopar fairlead adapter required). The one-piece heavy gauge steel winch plate is press brake formed, welded and finished with durable black powder coat paint. All necessary installation hardware is included. Made in USA.